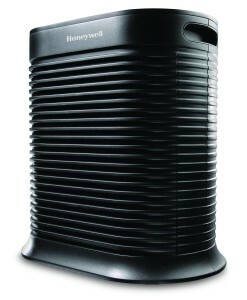 Honeywell has long been established as a leading manufacturer of quality air purifiers for allergies. Their unique designs are highly effective at recycling air throughout your home, and Honeywell purifiers tend to cover a much larger floor space than other units of similar size. This system can circulate the air of a 465 sq. ft. room 5 times per hour, making it an effective allergen remover for a large room or small apartment. In saying that, we have found that some customers use this unit over a floor space of 1400 sq. ft. and are happy with the results. Everyone’s requirements will vary however, so if you have particularly bad allergies, you will want to consider sticking to a floor size that will receive consistent air replenishment. The Honeywell HPA300 comes with high quality seals around the filters to allow for minimum leakage. This means that all the air being replaced passes through the HEPA filters, allowing them to perform efficiently and remove allergens effectively. An intuitive, yet simple design gets the most out of the filtration system and this is why Honeywell is the #1 recommended brand of air purifiers by allergists. As an alternative to the Honeywell 360-degree air intake purifiers (only available in white), the HPA300 receives air from the front of the unit, expelling clean air from the top. This makes it suitable to place flat up against a wall without compromising efficiency. HEPA filter air purifiers are world-class when it comes to managing allergies around the home. Removing 99.97% of airborne particles such as pollens, molds, fungi, pet dander, dust, dust-mites and even cigarette smoke – your home can been quickly converted from a ‘trigger’ farm into a fresh air oasis. Many customers report better sleeping patterns as a result of buying a HEPA filter air purifier, and many enjoy the freedom of putting their allergy medication to the side while they are in their own home! While you’re saving money on allergy medication, you also won’t need to worry about expensive running costs either. The Honeywell HPA300 boasts low power consumption, has 4 fan speeds and comes with a ‘sleep’ timer function for ultimate control over energy use. For a couple of dollars per month, many customers report they leave the air purifier on a ‘low’ fan speed 24/7 and just kick it up a notch on a heavy pollen day or when cooking. Although the HEPA filter is the major filtration source in this air purifier, it also comes with an activated carbon pre-filter to catch larger particles and remove odors. This filter is recommended to be replaced every 3 months, however if odor reduction is not on top of your priority list, a quick vacuum every now and then will keep it useful for much longer than 3 months. 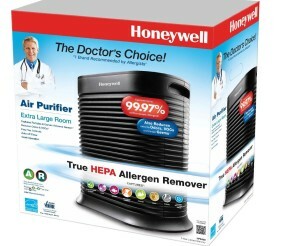 The Honeywell HPA300 air purifier for allergies comes with even more peace of mind attached. This purifier comes with a 5 year limited warranty so you don’t need to worry about the quality of build. It’s certainly worth the wonderful night’s sleep you’ll have when you get one of these systems into your home.